EDGEWOOD, Md. 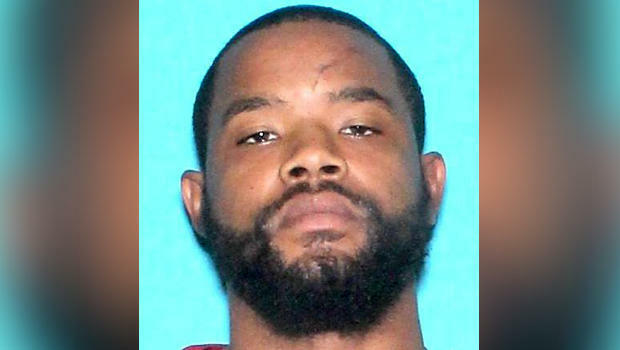 -- Radee Labeeb Prince -- suspected of opening fire at a Maryland office park just before 9 a.m. Wednesday morning, killing three co-workers and critically wounding two others -- was caught in Delaware, the Bureau of Alcohol, Tobacco, Firearms and Explosives (ATF) confirmed to CBS News. ATF released a statement Wednesday evening: "ATF Baltimore Field Division and our allied law enforcement partners can confirm that the suspect, Radee L. Prince, has been apprehended in Newark, Delaware, and is in law enforcement custody. The firearm has also been recovered and is in law enforcement custody." Officials held a press briefing Wednesday night with updates and to say that the suspect discarded a handgun and fled when police spotted him walking in a town. Wilmington, Delaware, Police Chief Robert J. Tracy said the suspect was apprehended at 7:05 p.m. in Newark, Delaware, after a brief foot chase and the suspect discared a .380 firearm. The vehicle authorities found earlier in the night was unoccupied and officers from multijurisidictional areas tracked the suspect down near a high school. The tip eventually led to Prince's apprehension. He never made it onto school grounds. "We're very lucky ... our agents are safe and so is our perpetrator," Tracy said, answering a question from the media about the danger officials faced with an armed suspect. Tracy said that "no stone was unturned" in the manhunt Wednesday. Tracy said he "got chills" during the manhunt and "knows what it's like" when authorities were tracking Prince down. Officials say that the process of preparing arrest warrants is taking place in both states and Prince will be arraigned. If he doesn't make bail, arrangements will be made to physically move him to Maryland to face charges. No timetable was discussed. Officials released information about the victims of the shooting with a Facebook post Wednesday night. The deceased were identified as Bayarsaikhan Tudev, 53, of Virginia; Jose Hidalgo Romero, 34, of Aberdeen, Maryland; and Enis Mrvoljak, 48, of Dundalk, Maryland. The shooting rampage set off a manhunt along the Interstate 95 Northeast corridor. Police cruisers were stationed in medians, and overhead highway signs displayed a description of Prince's sport utility vehicle and its Delaware license plate. The FBI assisted state and local authorities in the manhunt. Earlier Wednesday, Prince, 37, was also involved in a later shooting about 55 miles away in Wilmington, Delaware, Wilmington police confirmed. Wilmington Police Chief Robert Tracy said a victim who was shot twice at a car dealership less than two hours after the Maryland shooting identified Prince as his assailant. Like the victims in Maryland, Tracy said Prince knew his victim in Delaware. "This is targeted -- this individual knew the people he wanted to go shoot," Tracy said. "This isn't a random act of violence." Harford County, Maryland, Sheriff Jeffrey Gahler said earlier Wednesday that Prince shot his victims with a handgun just before 9 a.m. and fled the Emmorton Business Park in Edgewood, which is about 25 miles northeast of Baltimore. He said deputies were on the scene within four minutes of the report of a shooting. The victims and the suspect worked for Advanced Granite Solutions, the owner of the company that designs and installs countertops told The Associated Press. Prince has been an employee for four months, working as a machine operator, owner Barak Caba told the AP in a brief telephone interview. Caba was shaken and would not provide additional details. Gahler said Prince was scheduled to work on Wednesday when he walked in and opened fire. He said he believes the victims were targeted, but couldn't speak to a possible motive. "I don't think anybody anticipated an issue here today when he came to work," Gahler said. "I don't think anybody thought something like this would unfold here today." Gahler said there were more than the five victims inside the building when Prince allegedly opened fire. "My suspicion is, if he could have shot more individuals, this incident would have resulted in a greater loss of life," Gahler said. The wounded remained in critical condition as of 4 p.m., according to the University of Maryland Medical Center's R Adams Cowley Shock Trauma Center in Baltimore. Maryland Gov. Larry Hogan, speaking during a break from a meeting of a state board, said the survivors had gunshot wounds to the head. He said authorities had helicopters in the air and law enforcement on the ground looking for Prince, who was believed to be driving a black 2008 GMC Acadia with the Delaware license tag PC 064273. Tracy, the Wilmington police chief, said authorities received a call around 10:46 a.m. for shots fired at the Wilmington car dealership. He said the victim had been shot twice, but was alert and was able to help authorities link the crime to the Maryland shooting. Delaware authorities had just that morning received a lookout alert from the Maryland State Police for Prince, who the Wilmington victim identified by name, Tracy said. Wilmington officers who were responding glimpsed Prince's car speeding away and attempted to give chase, but the vehicle was too far ahead and they lost it, Tracy said. Tracy said Prince and the Wilmington victim have "had history together, had beefs together" through previous criminal cases, but wouldn't go into detail. Prince has a lengthy criminal history, officials said. Tracy said he has 42 arrests in Delaware and 15 felony convictions. CBS Baltimore reports he was also charged with being a felon in possession of a firearm in Cecil County, Md. Prince was fired from another job earlier this year after he attacked a co-worker, according to a petition for a peace order filed by his former boss and obtained by CBS News. fired Prince for punching a co-worker in the face. The petition said Prince came back to the Edgewood, Md. business after the firing, "justifying what he did was right because the other guy was saying some things that he did not like." The petitioner said he refused to take Prince back. He said his business later got a letter saying that Prince was seeking to collect unemployment. He said he responded that Prince had been fired and was already employed at another company. He said Prince then again returned to the business and threatened, cursed and yelled at him. The man wrote: "I felt very threatened because he is a big guy and very aggressive on me." The man said Prince did not get physical with him, but wrote: "I do not want to wait until he will." Kevin Doyle, of Thornhill Properties, said he was getting tools from his truck Wednesday when he heard screaming and saw three men running from the office park. The men told him someone was shooting and he asked if they had called 911. They said no, even though, Doyle said, they had phones in their hands. "I think they were just so scared they didn't (call 911). They had a look of terror," he said. Multiple businesses in the area were reportedly placed on lockdown, which was later lifted. Several Harford County public schools in the Edgewood area were also placed on a modified lockdown early Wednesday, which was also later lifted. The FBI is assisting local authorities. Investigators were treating the shooting as a case of workplace violence and didn't see ties to terrorism, said Dave Fitz, a spokesman for the Baltimore FBI field office. Yellow crime scene tape cordoned off Advanced Granite Solutions on Wednesday afternoon. Investigators, deputies and federal agents fanned out across the business park to investigate. Across the road, several employees, some wearing lime green T-shirts with the Advanced Granite Solutions logo, embraced each other as they waited for news of their colleagues. The sheriff said the department had set up a receiving area for family members in a nearby hotel ballroom. According to online court records, Prince lived in Elkton -- about 35 miles from the shooting scene -- as recently as last month. The sheriff said authorities checked an Elkton home after the shooting, but Prince was not there. Gahler said authorities believe Prince acted alone.